Starting in Fall 2019, OIA will require all international students, new and returning, to complete an online check-in. The online check-in form takes about 5-minutes to complete, and asks for information about your immigration documents, address and contact information, and program of study. This is to keep OIA informed about your Program and to streamline SEVIS reporting. 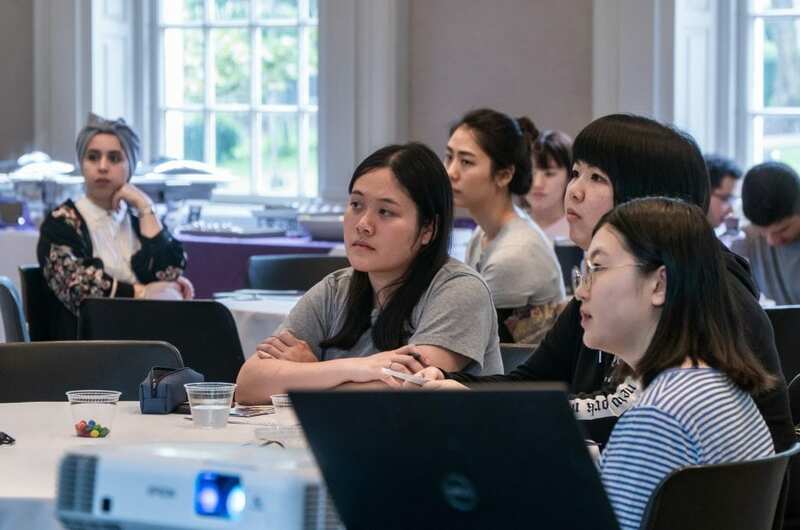 New students are still required to attend the mandatory new international student orientation, but the online form will allow them to supply information in advance of the orientation. Your I-20 is a ‘living document’- meaning that it must be kept up-to-date, and any changes must be entered into your SEVIS record. As an example, students are required to report changes of address and contact information to OIA within 10-days. This is required by regulation. By submitting the online form at the start of each semester, this will act as a reminder of the regulations and what you need to do to maintain student status. OIA sends monthly reminders on how to maintain status, and information on upcoming activities and workshops. The office of international affairs is open Monday through Friday from 9am- 5pm. Please make an appointment by emailing InternationalAffairs@cahtham.edu or calling 412.365.1388. The first event of the semester, the Global Mixer welcomes students to Chatham, and welcomes back returning students. Students, from a variety of countries and cultures are encouraged to mix and mingle as they learn from each other. 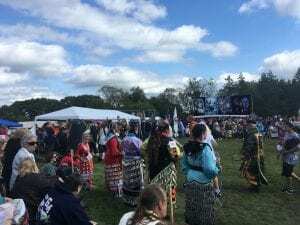 Council of Three Rivers American Indian Center (COTRAIC) 40th Annual Three Rivers Pow Wow. Students from the United States, Japan, China, and South Korea attended the Pow Wow and engaged with Native Peoples from all over the US. The Pow Wow, held each September, is open to the public. Simmons Farm was a day of sunshine, pumpkins, apples, and fall flowers. The group of 16 headed out to Simmons Farm on one of the warmest days of Fall and enjoyed the activities it had to offer. After a quick hayride, students split into two groups and found their way through the corn maze. Students then chose a pumpkin from the pumpkin patch and enjoyed some of the cider provided to the group from the Farm. There were fields of beautiful flowers and delicious festival food to snack on. 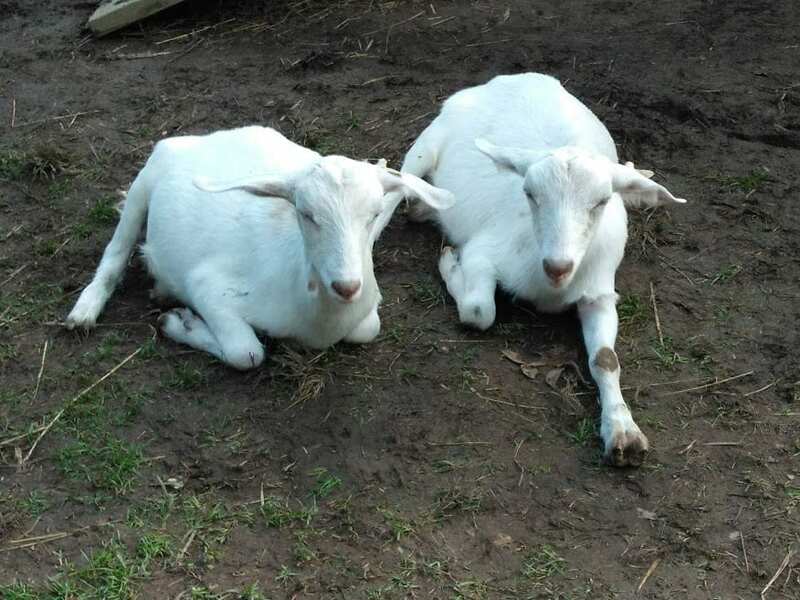 The farm even included a petting zoo with some lazy goats and hungry chickens! 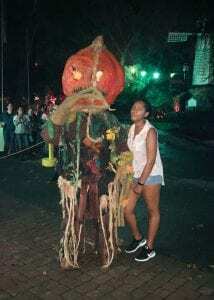 As part of the fall semester long weekend, OIA took students to Kennywood. 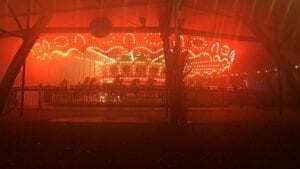 Kennywood, a local amusement park in operation since 1898, has thrilled generations of visitors. 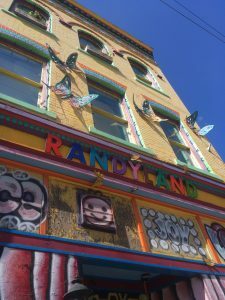 Located a few miles from Pittsburgh, it has roller coasters, a midway, arcade games, and classic American fare. In October, the park is transformed into one big haunted house for Phantom Fright Nights. Open late (6pm-midnight) and full of spooky costumes and decor, it’s a screaming good time. 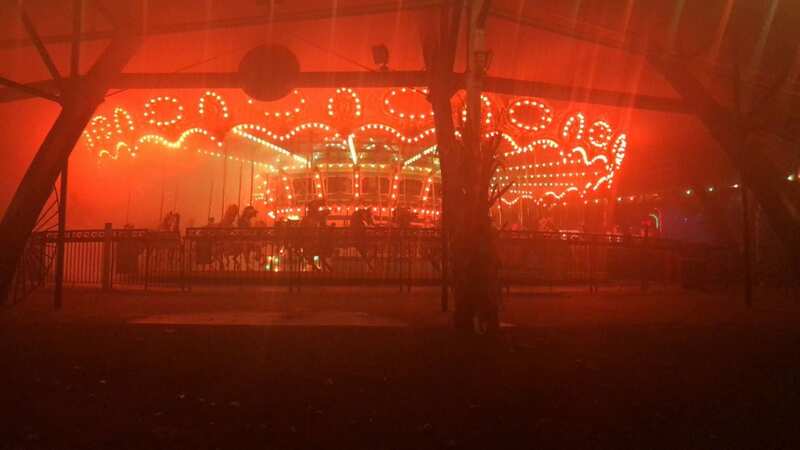 Students from Brazil, Austria, Japan, South Korea, the US, and France, were able to enjoy a classic American amusement park, and Haunted attraction on a foggy spooky night! 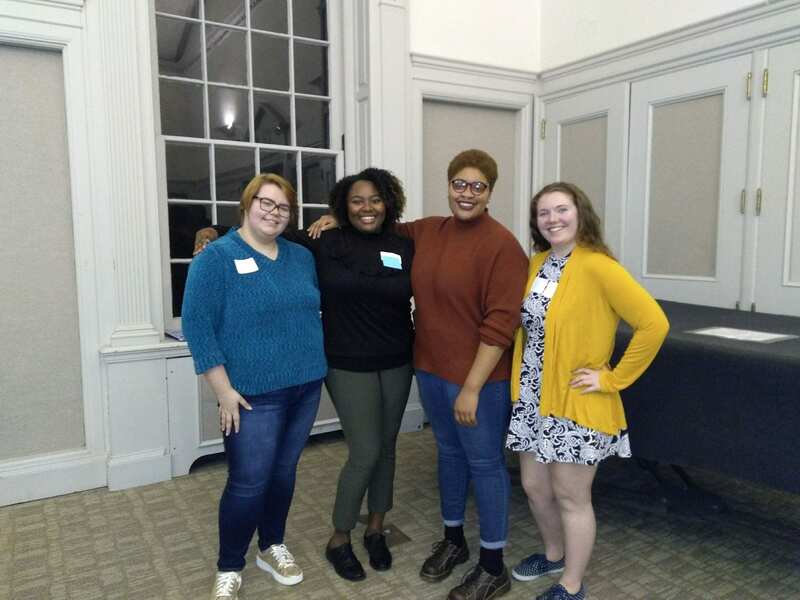 Students celebrated the end of the semester, and for many the end of their studies at Chatham University, during OIA’s End of Term party. 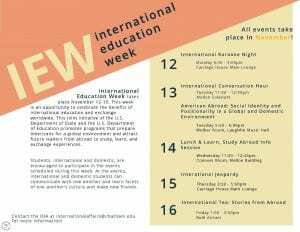 International Education week is an opportunity to celebrate the benefits of international education and exchange worldwide. This joint initiative of the U.S. Department of State and the U.S. Department of Education promotes programs that prepare Americans for a global environment and attract future leaders from abroad to study, learn and exchange experiences. Students, international and domestic, are encouraged to participate in the events scheduled during this week. 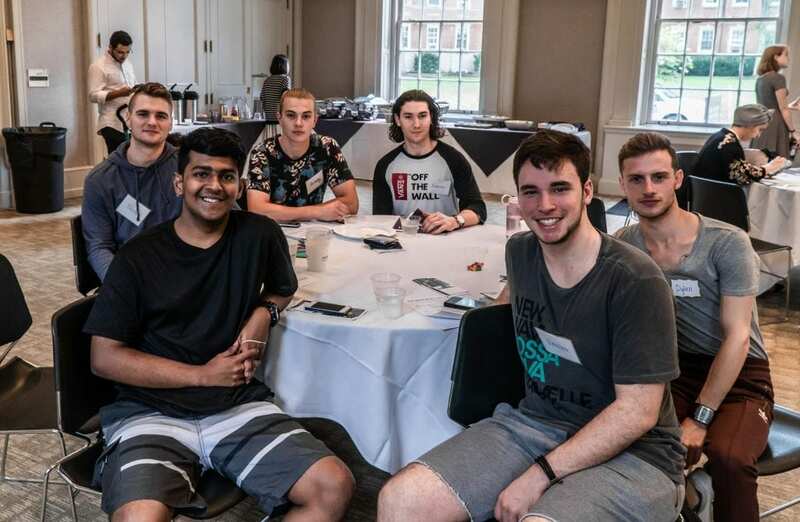 At the events, international and domestic students can communicate with one another and learn facets of one another’s’ culture and make new friends. 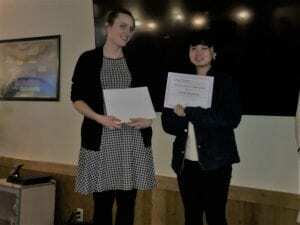 On Monday November 12th, the Office of International Affairs partnered with the Chatham University Modern Language Department for “International Karaoke.” Offered each semester, this popular events brings together students to sing in Arabic, Chinese, French, German, Japanese, Spanish, as well as other languages. Students in the Modern Language classes are able to practice by singing in their target languages. 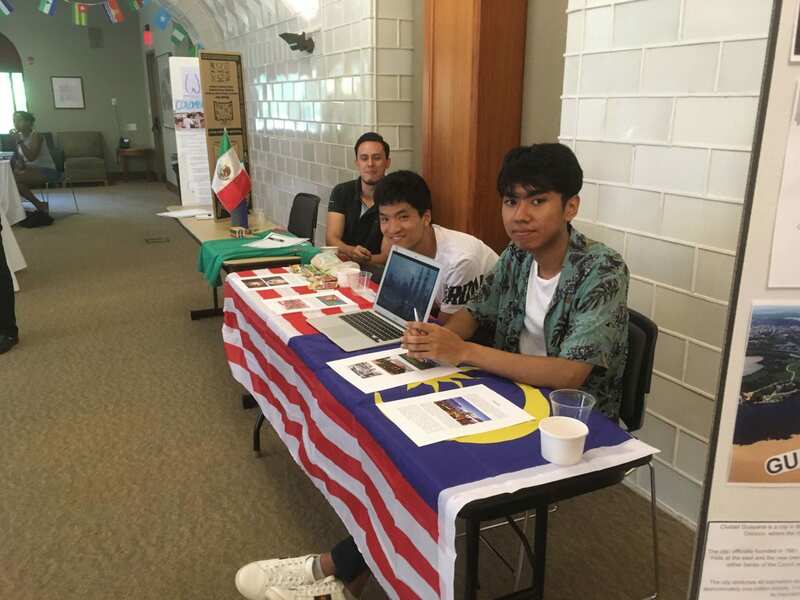 With well over 100 in attendance, International Education Week started on a high note. 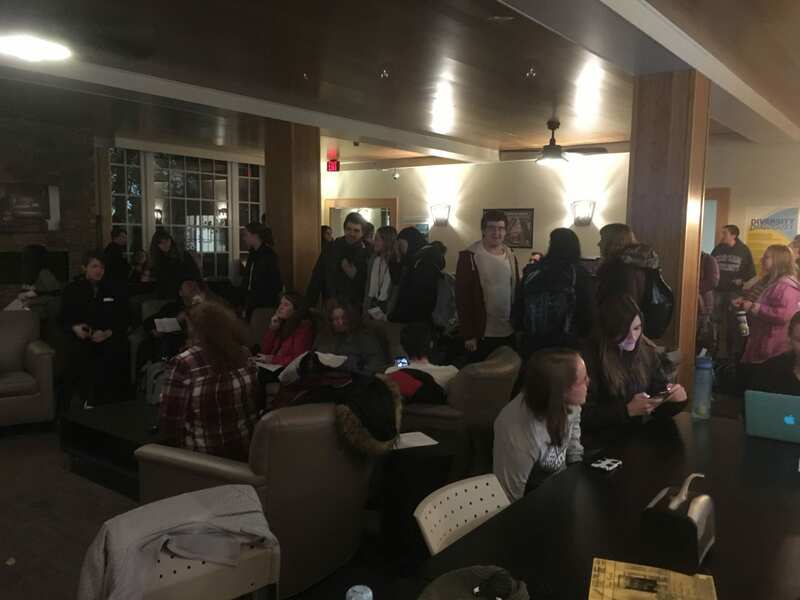 On November 13th, students were invited to the international conversation hour, in the Mellon solarium. The international conversation hour provides topics for students to discuss in order to develop understanding of each other’s cultures. Later that evening, the Chatham University Vira Heinz Scholars presented on “American Abroad: Social Identity and Positionality in a Global and Domestic Environment.” Students, Miranda Boyden (studied in Italy), Janelle Moore (Costa Rica), Erion Morton (Japan) and Kaylee Spitak (Japan) studied in the summer of 2018 with support from the Vira I Heinz Program for Women in Global Leadership. The VIH program “prepares women for tomorrow’s global challenges by offering a unique opportunity for international experiences, leadership development and community service.” Students receive $5000+ scholarship for an international educational experience. 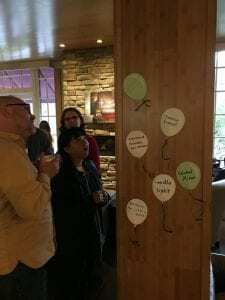 The Chatham 2018 CEE, American Abroad: Social Identity and Positionality in a Global and Domestic Environment involved roundtable discussions around social identity and its impact on students’ experiences at home and abroad. Thursday November 14th was a cold and rainy day for trivia! 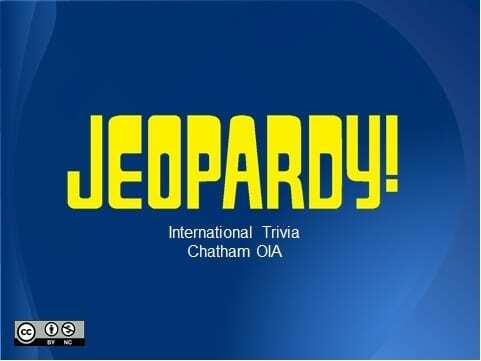 OIA hosted the International Jeopardy contest in the Carriage House, and tested students’ knowledge of world history, geography, and global facts. With quite of few interested in playing, students played in teams of three to pool their knowledge. With challenging questions, such as “Which country lists internet access as a human right?”, students played through five categories. Though last coming into final Jeopardy, Team Brazil, won with a high bet, and the correct answer. Students Dylan Jacquard, Vinni Muniz, and Mana Soda claimed the title of International Jeopardy Champs! The final event for International Education week was a welcome respite from biting cold. 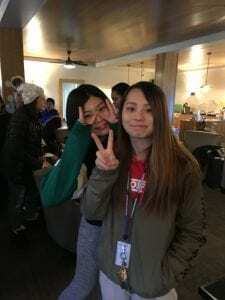 On the day of the first snow of Fall 2018, the staff of the Office of International Affairs met students both local and international to celebrate diversity with a hot cup of tea. The International tea party included flavors from the strong and bitter Irish breakfast to the mellow sweetness of tropical mango and chocolate. 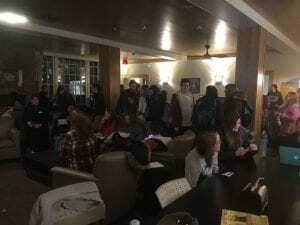 This helped warming the attendees and made the conversation flow, everything from food, to internships, to study abroad, to difference between the United States and other countries was discussed. Many students coming and going from class also stopped by to join conversation and enjoy a hot beverage. 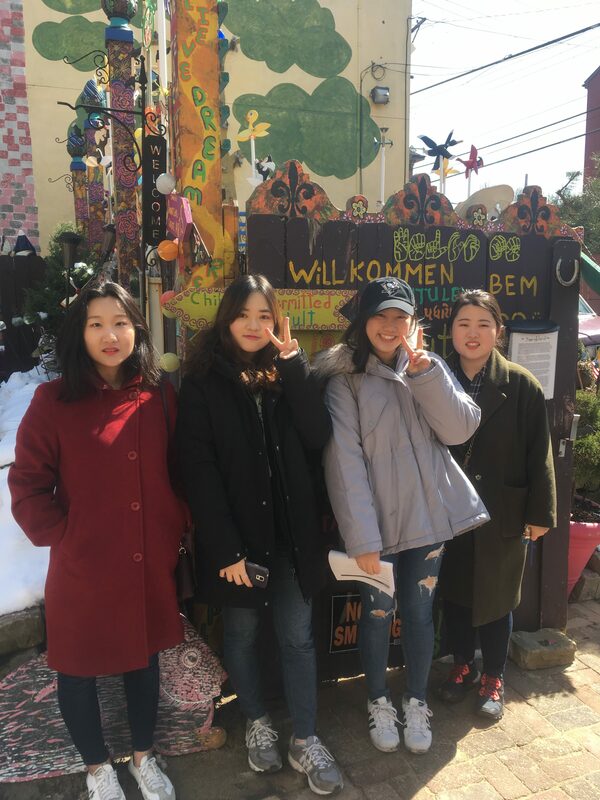 Over the course of IEW, Chatham students across campus were able to engage in international and intercultural learning. A large screen glows in the pitch-dark classroom. It is eerily quiet. I peek around the screen on my podium to see 23 transfixed students, wide-eyed and hands covering mouths. On the screen, the ceiling explodes. An alien tumbles onto the floor as scientists and soldiers scream as they scramble for safety. Screams ricochet in our room, followed by nervous laughter. This is US Culture and Cinema, a 100-level culture-based course that students take to learn about American culture, values, traditions and so much more through the lens of top ten classic American films. Pre-reading activities include summaries, background information handouts and short video clips. For each film, post-reading entails heavy discussions and a set of carefully crafted handouts designed to get students to reflect and synthesize information they’ve learned. Each handout builds upon their understanding and skills, starting with formulating their opinion, close critical reading, and summary honing. Film synopses are gapfill with word banks, giving students a chance to understand the story while they learn practical academic and technical vocab. Another handout doles out juicy film trivia followed by lively discussions in which they justify their favorite items. Same for quotes and film excerpts—with these they explain the humor, or infer why the character says something, and they act out parts of scenes as intoned in the film. There is a vocab match with words, phrases, and idioms and images. The Best Summaries has them choose the best summary out of 5 or 6 similar film genre summaries, specific character names removed. While they actively watch the film, they follow along while completing questions with multiple choice answers. Questions are kept as simple as possible to prevent students from missing important moments. Images of the main characters are shown on this handout, along with images and maps of ideas or places at the end. The While You Watch questions and answers are designed to help students follow along with ease an otherwise potentially confusing film. Each week, I send short video clips related to the film, director, film theory, and technical elements such as angles & shots and sound used in the film for them to watch and take notes for discussion. They then discuss the ideas they found most interesting and explain why. Class participation is typically very lively. I have 3 criteria for choosing films. It should reflect American culture, values, traditions, and/or social issues. The film should also be a little older so that there is less chance of students having seen it. And finally, it should be in the top 10 or 20 for its genre. This semester we watched Kramer vs Kramer (Drama), Singin’ in the Rain (Musical), Rear Window (Thriller), The Shining (Horror), The Good, the Bad, and the Ugly (Western), Aliens (Sci-fi/Action), Big (Comedy). Traveling over winter break? Be prepared! Study in the States, the official website for international students in the US has released their tips for students planning to travel over winter break. This information is helpful for international travel, regardless on when you go. Meet with your designated school official (DSO). The DSO will confirm your student status and sign your I-20 for Travel authorization. They will confirm your current address, contact information, and enrollment. Don’t forget all the required documents for travel! Remember to take your passport, valid student visa, and your form I-20 when you travel. Make sure these documents are kept close at hand, and not put in checked baggage. It may also be a good idea to bring a copy of your enrollment verification- which you can print from your MyChatham account. What if you receive a Form I-515A? First, don’t panic! The Form I-515A is issued by Customs and Border Patrol (CBP) if you are missing required documentation. It allows you to entire the US for 30-days in order to obtain and submit the missing documentation. If you receive a Form I-515A, contact your DSO immediately. Read the full article at Study in the States . Orientation for New International Students. Welcome to Chatham! 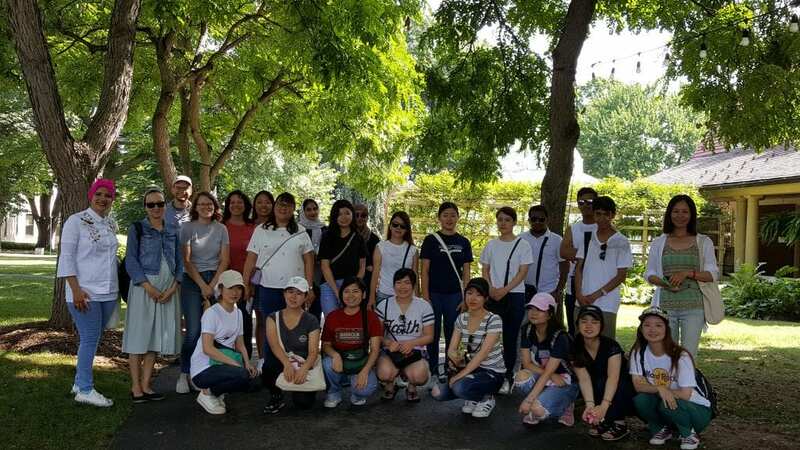 While summer may be a slower time for many, the Office of International Affairs was in full motion with 14 intensive courses from the English Language Program, a four-week program for 10 students from Wenzhou Medical University, immigration recertification, and international visits for partnership development, to name a few activities. 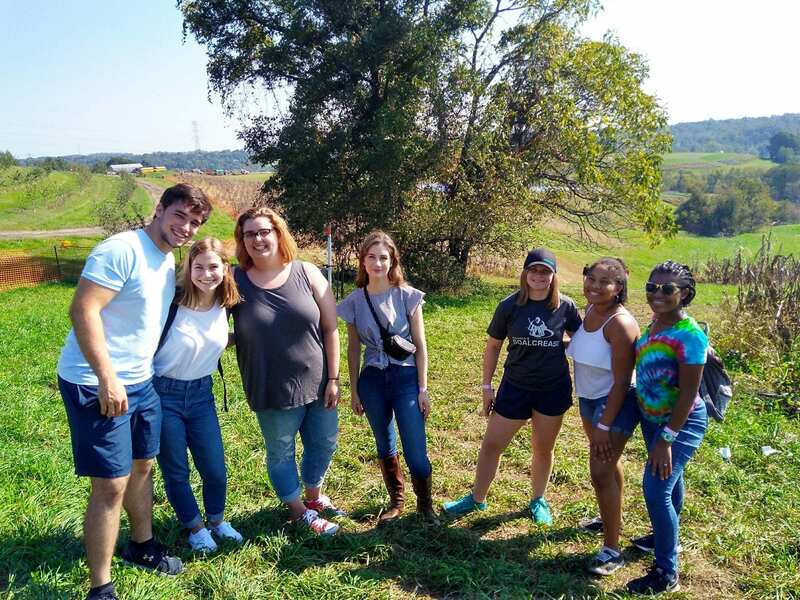 Fall 2018 brings fewer new international students than last fall, but plans have been made for a productive semester with a host of activities for the Global Focus Year of Ireland; exciting opportunities to study abroad, including scholarship opportunities; and a robust cultural program to celebrate languages, cultures, and international education. Read through our eNewsletter for information on these programs. Here are a few highlights of the summer. 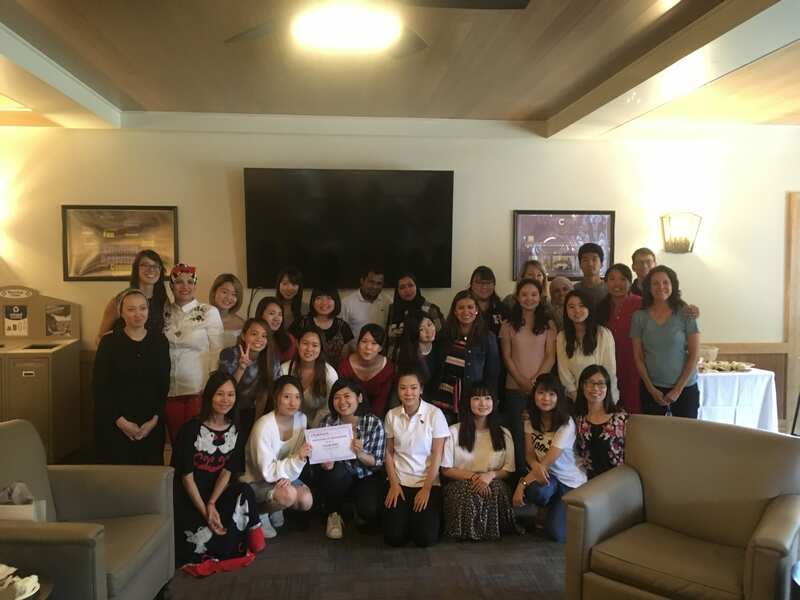 With thirty-three students, 70 hours of weekly instruction, three full-tuition scholarships offered to local students, the ELP celebrated the success of the semester with a guest speech from Natalia Castillejo, Product Manager at Duolingo; student speeches by Fadia Azzani and Gabriela Gomez; and music performances from Ayaka Fushino, Ai Fudano, Hong Zhao, and Hong’s husband. It was a wonderful celebration of language and culture! Opportunities for students for social interactions and cultural discovery include a Conversation Partner Program, Waterfront Battle of Homestead Tour, Mexico War Street Tour, trips to outstanding museums Pittsburgh has to offer, a potluck with education students, BBQ parties at Dr. Phung’s and Mr. Musick’s houses, among others. Students also traveled to so many cities and attractions in the U.S., Canada, Mexico, and Cuba. What an adventurous bunch! 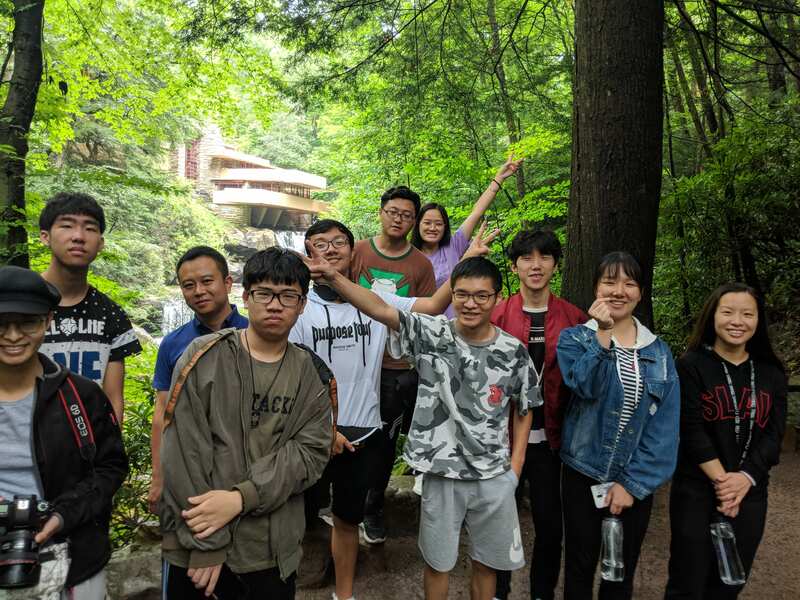 Ten students majoring in psychiatry at Wenzhou Medical University participated in a four-week program organized and led by AVP Chris Musick. The students participated in workshops taught by faculty from the Psychology Department, cultural explorations led by AVP Musick, and selected lessons in some ELP’s courses. Many of the workshops had experiential components taking the students to museums, the zoo, and the Allegany Cemetery. The students learned many new concepts which they had not encountered before in their studies in China. After over 18 months, the Pittsburgh Pathways was finally approved by SEVP. The approval was needed in order for Chatham to issue immigration documents for students to apply for a visa to enter the U.S. and attend the program. 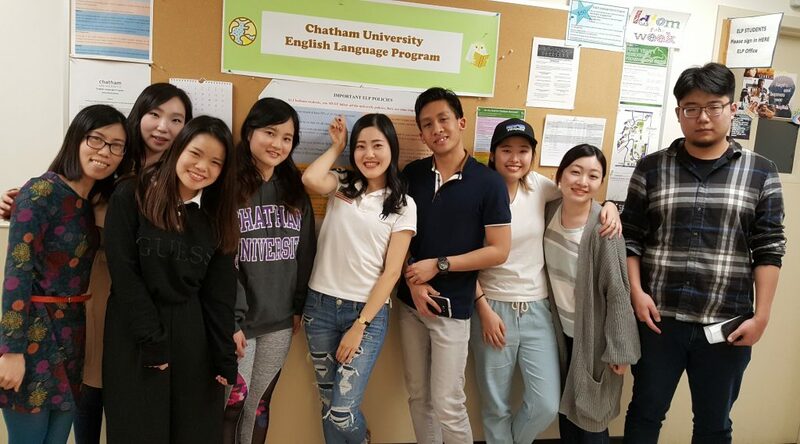 Following the approval was intensive work to apply for a SEVP recertification to allow Chatham to continue to enroll international students and host international scholars in its programs. On the study abroad side, Chatham undergraduate students participated in summer study and internship opportunities in Costa Rica, Germany, Indonesia, Italy, Japan, Korea, Mexico, Netherlands, Poland, and Spain. 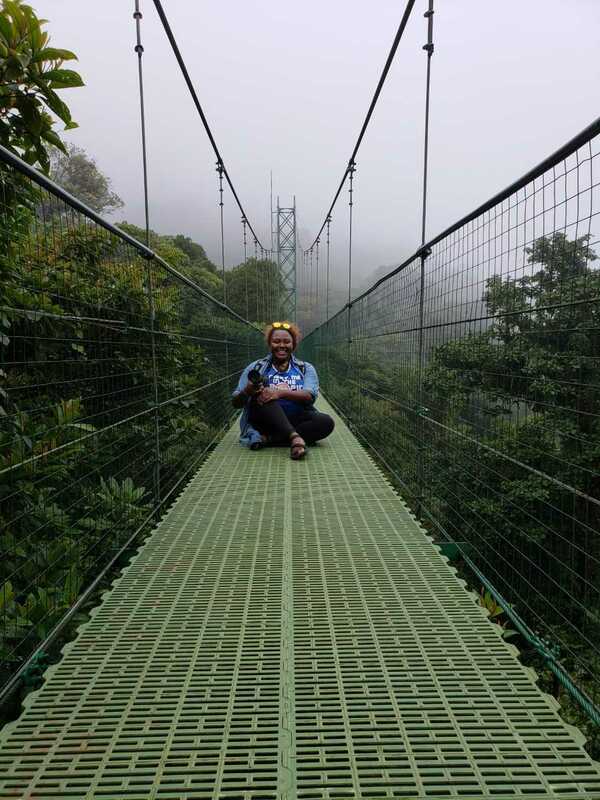 Graduate students studying Occupational Therapy and Physical Therapy participated in a summer field experience in Ecuador. AVP Musick visited China with Dean Downey in May to build institutional partnerships. There is now interest from Wenzhou’s College of Nursing, College of Psychology, School of Foreign Languages in building sustainable student and faculty exchanges. In addition, the staff in the Office of International Affairs attended the NAFSA conference in Philadelphia with about 9,500 other attendees all over the world. We caught up with existing partners and connected with potential new ones. 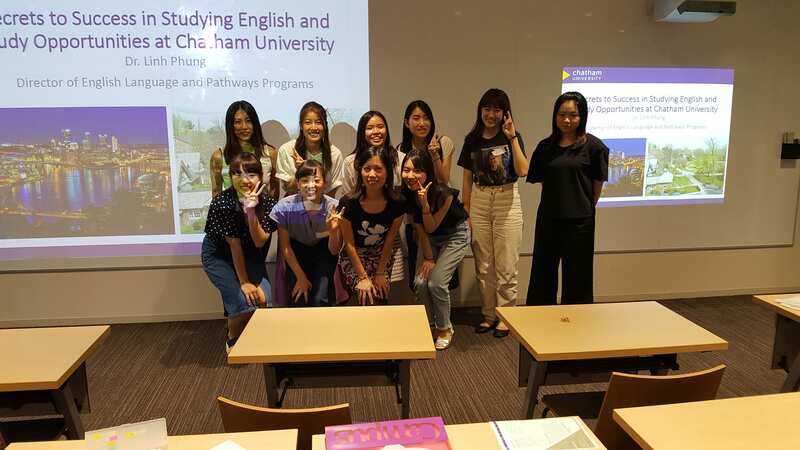 In July, Dr. Linh Phung visited long-lasting university partners in Japan, which together have sent over 100 students to Chatham since 2011. Partnership work is intense and intensive, but also rewarding. With the summer semester behind, we are looking forward to an exciting academic year ahead! The English Language Program at Chatham University awarded three full-tuition scholarships to three local students in the summer 2018 semester. The students shared their stories and comments about the English Language Program in an interview with Shawn Kent, ELP Tutor, below. 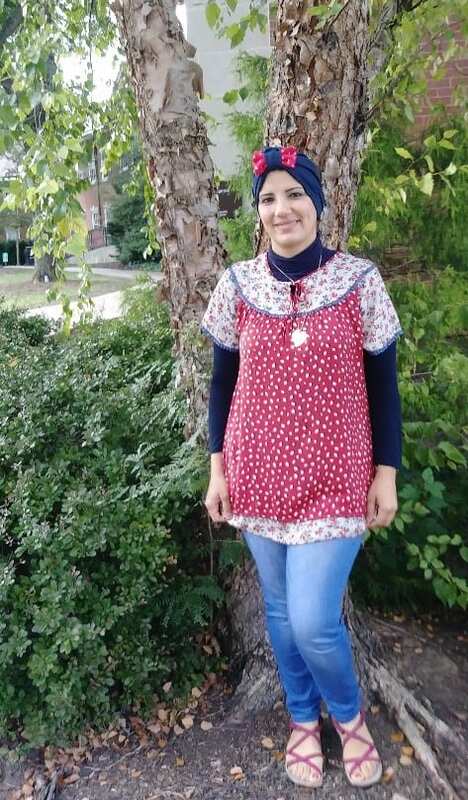 When Farazdaq Alhammood started the ELP program at Chatham she had already lived in Pittsburgh for many years. 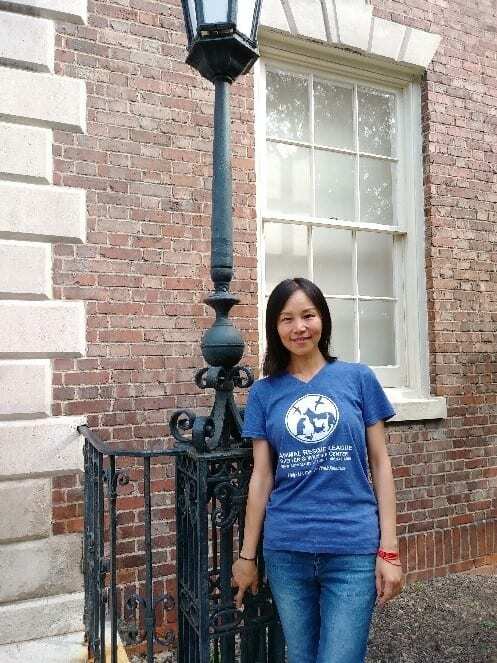 Her goal is to pass her TOEFL exam, a requirement before getting her Ph.D. in biotechnology and genetic engineering. She has an MA in biotechnology from her home country of Iraq. The hardest thing is time. The summer program is short and intensive, and that creates some pressure. It goes fast. Still, her English—particularly her understanding of grammar, she says—has improved. The first year in Pittsburgh was difficult. She had to find a job, study, and take care of her three kids. Two of them were born here. Her extended family was not around. In her own country she depended on her family. Now, she is stronger and feels more responsible for herself. American culture was not hard to adjust to. She talks to her American neighbors. And she likes the holidays: Christmas, Thanksgiving, Halloween. She likes free summer movies in the park. “I’m so happy here,” she said. Her favorite place is Point Park at sunset. She spends time with her family at the park. They enjoy the big fountain and being near the river. When she is not with her family, she spends her time studying at Chatham. 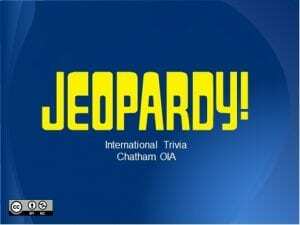 “I know Chatham. It’s near our house. 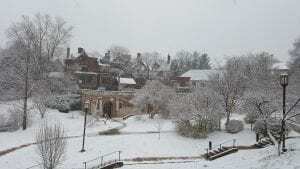 I love this place,” Hong said, when asked what she thought of Chatham. The only thing she would change is to have more students from other countries and to mix them all up in class, rather than let students from a particular country stick together. 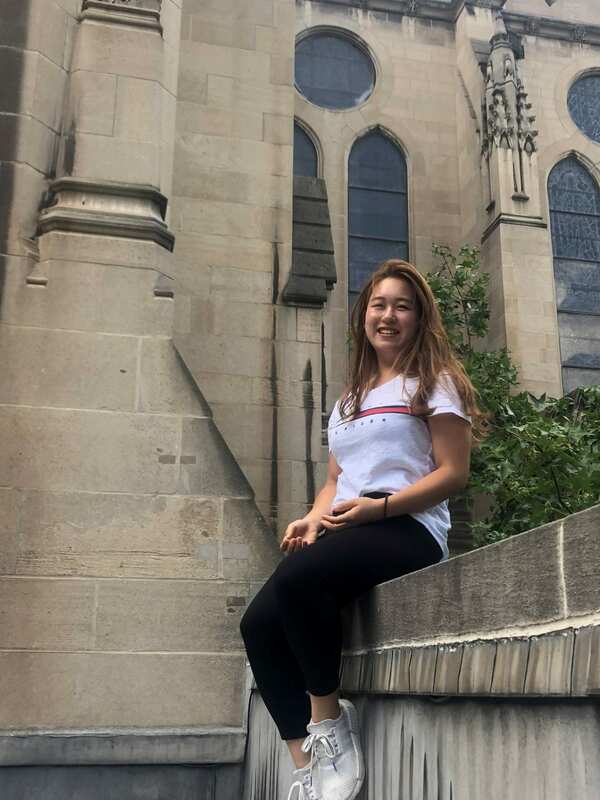 Hong was living in Pittsburgh and taking classes at Literacy Pittsburgh, where they told her about the scholarship program to study English for the summer at Chatham. She applied and was accepted. The hardest thing about living in the U.S. for her was not knowing English. In her country, Hong could do a lot of things. Here, nothing. She felt stupid not knowing the language. But now she is better! Her husband is American, so she learns a lot from him, though he also speaks Chinese. He studied Chinese philosophy and has visited China several times. Hong studied to be a counselor in China. She wants to get a Master’s degree in psychology and counseling in the U.S. But first, she has to pass the TOEFL exam. That is her goal now. She would like to keep studying at Chatham, but is not sure if she can afford it. The scholarship has been a wonderful opportunity for her to pursue her dream. 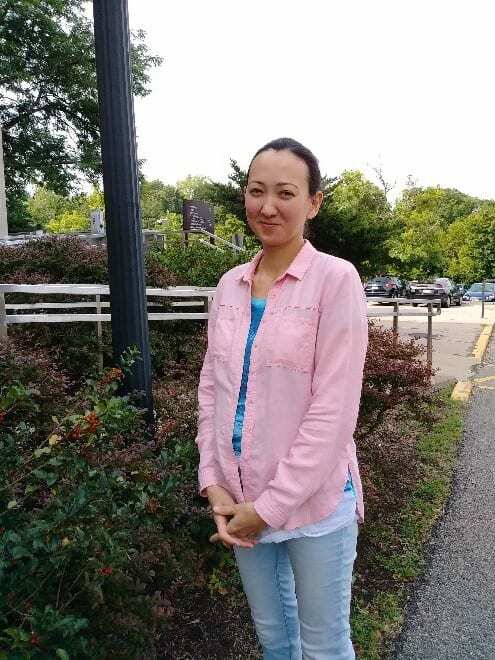 Hong Zhao told Ainagul about the scholarship at Chatham and it was Hong who encouraged her to apply. Ainagul is a caregiver for Hong’s family. She speaks Russian at home with her husband, so she needs more time practicing English with other people. Her husband doesn’t speak English. He works at a pizza parlor where his co-workers also speak Russian. Luckily, Ainagul likes pizza. Her husband brings a pie home with him every night. One of Ainagul’s favorite places is the Carnegie Museum of Natural History, where she often takes her children. The family also likes going to the library where the kids can play and read. Next year she wants to pass the TOEFL and get an MBA at Chatham. She already has a degree in economics from Kazakhstan. One day, Ainagul would like to work at BNY Mellon Bank and, in the future, be a manager. Karun wrote a speech to celebrate the his graduation from the English Language Program at Chatham University. He shares that studying abroad has helped him to widen his outlooks of the world, grow up and stand on his own, and love to make mistakes because that’s how he learns new things. After studying at Chatham University for 9 months, I have gained much experience that guides me to become a person who I want to be. Before I talk about the challenges I face during my study abroad experience, I want to tell you about my background. I was an unconfident person who tried to avoid groups of people. In daily life I used to be alone rather than hang around with my friends. My parents were concerned about me that I might have trouble when I grew up because I would have to work with many people. After I graduated from university in Thailand, they decided to send me to study abroad. My parents said to me, “You have to regain your English language skills” and they took me the United States. I can still remember how much I resisted to coming to the U.S. I thought to myself so many times day by day about why they wanted me to go to the U.S. just because of English. Finally, when they said to me that I could come back after 6 months, I agreed with them and came here to Pittsburgh. Life in the United States was not as easy as I had thought. The first day I arrived in Chicago I had a horrible experience. I missed my flight to Pittsburgh, not because I was lost or I did not have enough time to transfer to another flight, but because of the TSA staff. She was very upset and shouted every minute, and she did her work very slowly, so I was stuck there for more than two hours and missed my flight. At that moment, I was so frustrated. I said to my mother who came along with me that I hated the United States. However, after that experience things got better. I tried to communicate with other students. At first, it was very hard to step out of my comfort zone. I was scared to make mistakes. I feared to communicate because my English was weak. I was afraid that I would lose my Japanese. However, I did not have any friend who can speak Thai, so it forced me to focus on my English. I am no longer afraid to face many challenges. I found Japanese friends. I overcame my fears. Don’t let your life drift away. Don’t let your emotions like fear control you – you have to control them. Don’t judge other people because you will learn something from them. Don’t fear to make mistakes. Don’t lose your hope because it will make you stronger. Step out of your cover and your will enjoy your new life. I cannot say I already achieve all of my goals of studying abroad. I still have to learn many things to improve myself. However, I think to myself that I would not be a person who I am right now if my parents had never let me study aboard, and I would not be joyful if I had never met my friends here. So I want to thank you to everyone who always supports me. Thank you. Asked to write a commencement speech to students graduating from the English Language Program, Aris writes, “We had better start looking at the light to see where we are going.” He urges the students to make the best of what they have now to have a great future. About Aris: My name is Aristote Kipayko. I am from the Democratic Republic of Congo, and I plan to graduate with a double major in Economics and Management Information System at Chatham University, class of 2021. I chose to get into business because I believe that everything nowadays is related to business and money. I am interested to know the real use of money and the different impacts it can have on any individual. I’m pleased to be with you at this time today for your commencement to a new step in your journey. Most of you have gone through a lot in order to be here with us. It may look easy, but only you can know the pain and suffering you have encountered. I assume that many of you had the same problem as me when arriving in Pittsburgh and trying to settle. 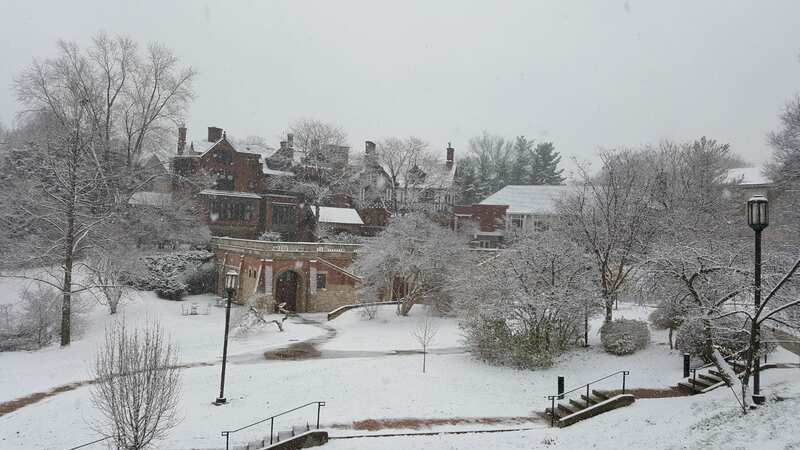 For me, the Pittsburgh weather was the first challenge I faced. It could get so cold in a day just as it could get so warm as well. I come from Africa and most of you might know or heard that it is usually way warmer in Africa in comparison to America. Adapting to the cold weather in Pittsburgh was really hard. Determination and desire to learn more were the keys to help me overcome that challenge. It helped me to stay strong and stay focused in class. Apart from the weather, food in America was also a big challenge. I was surprised that the quality of the food here would be so bad. I felt that I had led myself into a dark journey. I realized that I was eating more organic food back to my country, and it took me about two months to get used to the food here. In order to move forward, I had to make it a small deal and move on. Just like Ron Shayka said, “When all you see are shadows, you never see light.” We had better start looking at the light to see where we are going. Once again, I want to congratulate all of you for your achievements. We still all have a lot to achieve, but this is also a big step. Just like Steve Jobs said, “Stay Hungry and Stay Foolish.” Nothing is more important than always want to learn more. Success is a fruit from hard work and dedication. The future is in our hands. John Schaar wrote that “The future is not some place we are going to, but one we are creating. The paths to it are not found but made.” Therefore, you have to make the best of what you have now to have a great future. On Saturday March 24, students joined the OIA (Office of International Affairs) for the Spring Neighborhood Tour. Each semester, the OIA takes students to a different Pittsburgh neighborhood to showcase local culture and activities, and to encourage students to explore the city on their own. Students met at the Chatham Chapel, and we took the city bus to Wood Street in Downtown. From there students boarded the “T”- Pittsburgh’s own light rail system. The T is free within the downtown area, and can be used to travel to PNC Park, Heinz Field, and the Carnegie Science Center. The group walked along the Allegheny River from PNC Park to the Fred Rogers Memorial. Mr. Rogers is one of the most famous Pittsburghers, known for the children’s program “Mr. Rogers Neighborhood”. From there, we made our way to Allegheny Commons Park, and to the Mexican War Streets area of the North Shore. This area is full of Victorian-era row homes, gardens, and alleyways. It is listed in the National Register of Historic Places. The tour ended at the Mattress Factory, the premier museum in Pittsburgh for contemporary art. 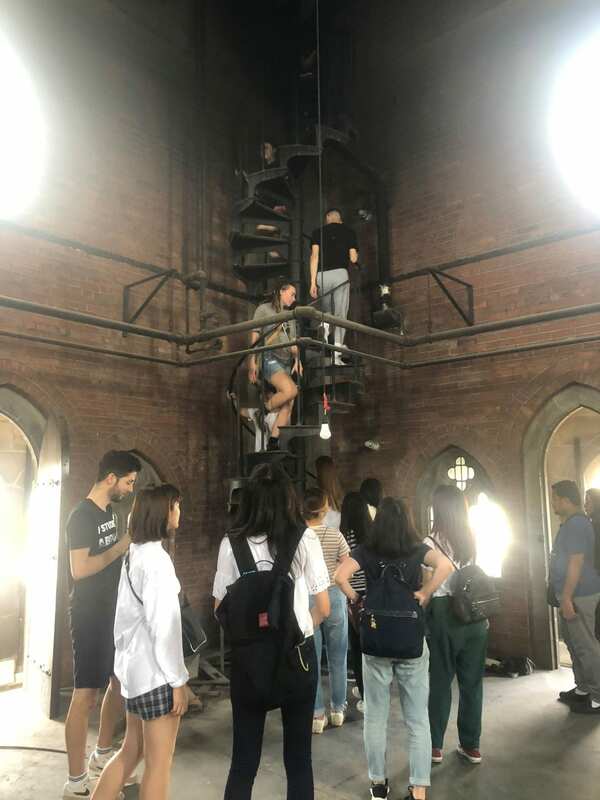 Students had the option to tour the Mattress Factory or go off on their own. 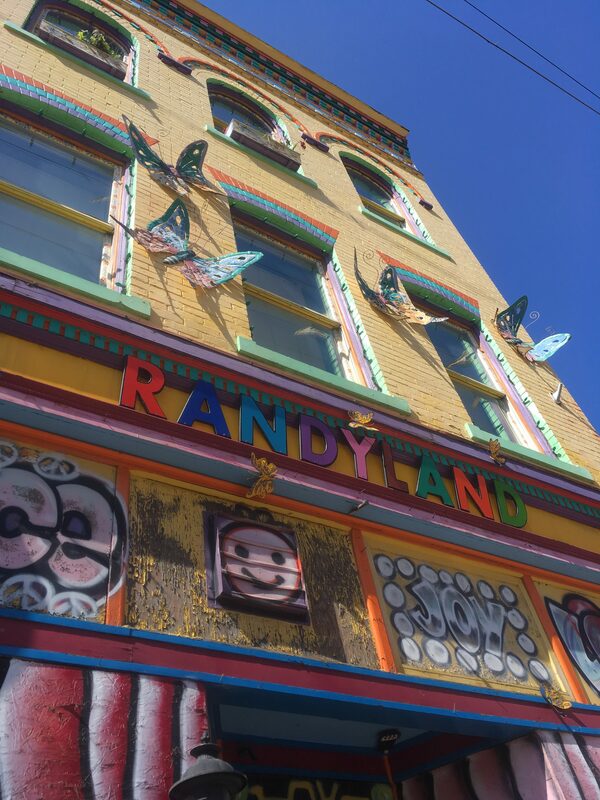 One group made its way to Randyland, located around the block form the Mattress Factory to explore the quirky artists’ welcoming space. Interested in Pittsburgh? Let the OIA know which neighborhood you want to explore! Our next adventure will take place in Summer 2018.